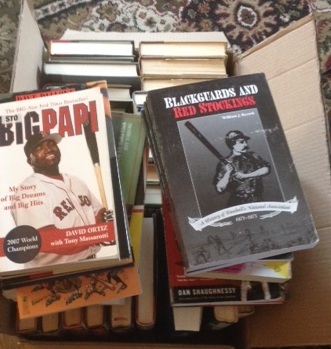 I will be bringing these to the Chapter breakfast today, Nov. 22, in Hamden. Available for a donation of $1 per book. A Farewell to Heroes. Frank Graham, Jr. HC w DJ. Clean. Baseball for Brain Surgeons. McCarver w Peary. Hardcover w DJ. Baseball for Dummies. Joe Morgan w Rich Lally. Trade size soft cover. Baseball Hall of Shame. Nash & Zullo. Trade size soft cover. Baseball Signs & Signals. Petroff w Clary. Trade size soft cover. Former Library. Behind the Mask. Pallone. Hard cover w DJ. Clean. Big Papi. Ortiz w Massarotti. Trade size soft cover, former library. Blackguards & Red Stockings. William J. Ryczek. Trade size soft cover. 4 new copies w minor wear. Blockade Billy. Stephen King. Book on CD. Boys of Summer. Roger Kahn. Trade size soft cover. Day By Day In Dodgers History. Cliff Gewecke. Trade size SC. Clean. Great Catchers of the ML’s. J Zanger. HC. Freehan illustrated front board has paper loss. Low and Inside. Ira and H. Allen Smith. HC, no DJ. Ex Libris. Men At Work. GF Will. HC w DJ. Clean. My Turn At Bat. Ted Williams with John Underwood. HC w/o DJ. Ex Libris. Nice Guys Finish Last. Durocher w Ed Linn. HC w DJ. Clean, nice. 2 similar copies. Nothing But the Truth. Don Baylor w Claire Smith. W DJ, stated First. October 1964. D Halberstam. HC w DJ. Nice, clean. Small tear DJ. Oh, Baby, I Love It. T. McCarver. HC w DJ. Perfect I’m Not. David Wells. W DJ, stated First. Pete Rose: My Story. Pete w R Kahn. HC w DJ. Clean, nice. The Physics of Baseball. Adair. Trade size soft cover. Psychology of Baseball. Mike Stadler. HC w DJ. Clean but for writing on end paper. Reggie, The Autobiography. R Jackson with M Lupica. HC w. DJ. Stated First. Small tears on DJ. Reversing the Curse. Dan Shaughnessy. Trade size soft cover. Former Library. Season Ticket. R Angell. HC w DJ. Clean. Small tear on DJ. Sports Illustrated Great BB Writing. Ed by Fleder. 557 pages, trade size SC. Clean. Summer of ’49. D Halberstam. HC w DJ. Clean. The Last Yankee. Turbulent Life of Billy Martin. HC w D j. Small tear on. DJ. The Complete Dodgers Record Book. Gene Schoor. Large trade SC. Clean. This Ain’t Brain Surgery. Larry Dierker. HC w DJ. Former Library book. End paper removed. Twilight of the Longball Gods. Schulman. Trade size soft cobver. Former Library. You’re Missin’ A Great Game. W Herzog w J Pitts. HC w DJ. Nice, clean. Throwing Heat. Nolan Ryan. Paperback. Great BB Feats, Facts, Firsts. David Nemec. Paperback. Best of Spitball. Mike Shannon, Ed. Paperback. Iron Man, the Ripken story. baseball Stars of 1971. Ray Robinson, Ed. Paperback.